Leo is down of relationships since he and his long-term boyfriend split after 5 years together. He’s been celibate for 18 months, trying to move on, and decides to make the most of his training in tropical medicine serving a month in rural Kenya to work with Doctors On Hand. He is blown away by the beauty, yet desolate poverty, of the tiny village where he is stationed. His medical training is desperately needed, and he digs right in beside one of the most stunningly beautiful men he has ever seen, Malik. Malik is not only an educated man who spent years in Nairobi, at nursing school and then as a nurse, he is a large man, built like the African warriors of yore. But he is home now amongst his family who live in this small village. In addition to assisting in the clinic, Malik hunts food for his large family and runs the local school. Leo’s absent libido is sorely tested working with Malik, but he knows better than to discuss his homosexuality with anyone in Africa–he truly fears beatings or worse. It is a careful dance, but Malik learns that Leo is aroused by him, and makes a very cautious foray into the personal realm. Even if Malik returns Leo’s advances, there is no privacy in this village, and Malik’s parents want him to get married. Plus, Malik’s sister has her eye on Leo. It’s all-around difficult. This is a refreshing romance written about two men from very different cultures finding love where they least expected it. The setting is lovely, and the stakes are high–neither can be found out. Also, there’s the element of danger with the nearby lions, snakes and hippos–not to mention marauders who come to rob the village. The romance is tender, yet spicy, with the added dimension of the racial differences. Expect an HEA, and a whole lotta sexytimes. I received a copy for my honest review. Interested? 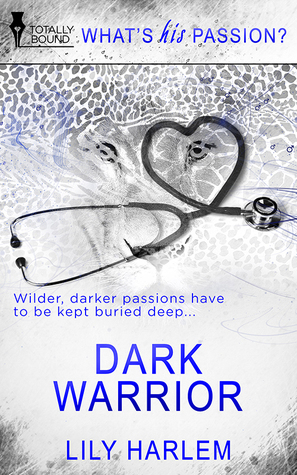 You can find Dark Warrior on Goodreads, Totally Bound, Barnes and Noble, AllRomance and Amazon. I haven’t read any M/M romances, but this sounds interesting. Thanks for sharing your thoughts!